For those embarking on a fall color tour in the Porkies, the journey is the destination. Every turn of the road brings a new splash of color—trees here turn vibrant shades of red, orange and gold, and because of their proximity to Lake Superior, the trees hold their colors longer than some destinations to the south. But while the journey is unforgettable, there are some driving destinations in the Porkies that are particularly special this time of year. 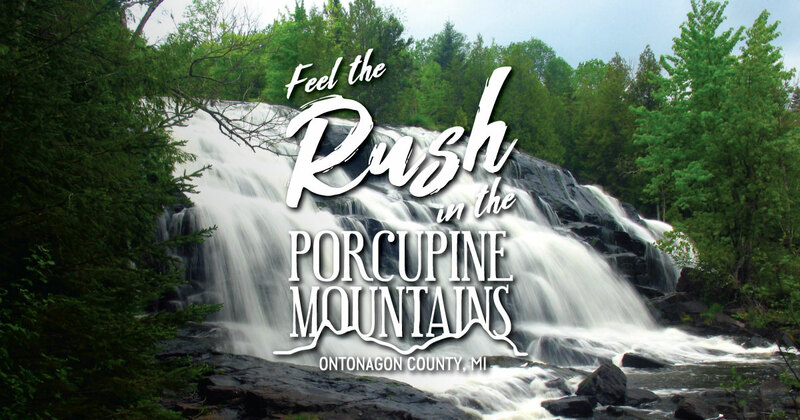 There are dozens of waterfalls in the Porcupine Mountains and Ontonagon County, and they’re now framed by fall color and free from the rush of early-season visitors. Here are some waterfalls to visit on your next fall color tour. Enjoy the drive and the view. This famous spot is considered of the most scenic falls in the Upper Peninsula. It’s located on the middle branch of the Ontonagon River. You’ll find the falls off Highway 28, about six miles southeast of Bruce Crossing. These breathtaking falls are among the most photographed in the upper Midwest. They are located about an hour south of the Porcupine Mountains and are well worth the drive. Located on the middle branch of the Ontonagon River, Bond Falls has a drop of about 50 feet over a wide swath of fractured rock, creating a series of rushing cascades. These pretty falls are located on the western edge of the Porcupine Mountains Wilderness State Park on the Presque Isle River. You’ll find three beautiful cascades—Manabezho, Manido and Nawadaha falls. There are many more waterfalls to explore. Click here to learn more!